OutWiker is a personal wiki and outliner with notes stored in a tree view, similar to directories on a disk. Plain text, HTML, and wiki format files are supported with pages capable of being linked to each other. Each tree branch can be opened as a separate wiki. Other features include tag support, global search (notes and tags), bookmarks, HTML syntax highlighting, and icons for notes. Cross-platform with a client available for Linux. How to extract: 1. Download the ZIP or 7z package and extract to a folder of your choice. 2. 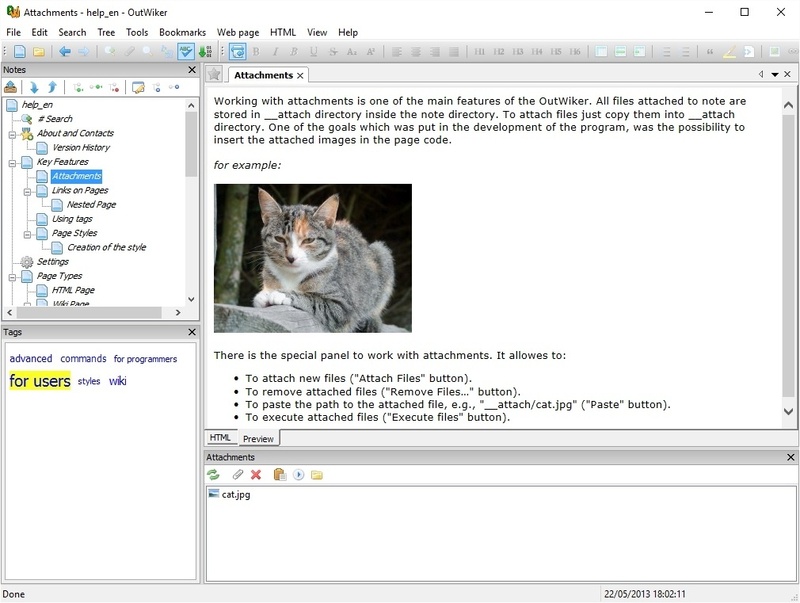 Create the file outwiker.ini in the program folder. Why are you cutting the actual version number off? OutWiker is at version 1.9.0.790, not 1.9.0, pay attention to what "About" says. I disagree with this practice of yours! Can't find what you are looking for? This list shows entries with Others - Specialized Editors as a supplementary function. You can view more entries with Others - Specialized Editors as a primary function.